Pandits see all of these as “equal”: a brahmin who is matured with knowledge, a cow, an elephant, a dog and a dog eater. This, in simple words, is the meaning of the verse quoted above. This quotation is favored often by speakers and writers in their speeches and writings. Apparently, anyone can notice that the quoted verse depicts the magnanimity of a pandit. The Constitution of India clearly states in unequivocal terms that there should be equality among all in all respects. Any one violating this rule is punishable as per the Indian Constitution.Of course, the Constitution of India is of recent origin when compared to “Bhagavadgeeta” which is 5000 years old as per our tradition. Hence every Indian feels proud of the magnanimous attitude of our ancestors. However, a good critic wonders as to how such a diversity of human beings and beasts so different in physical size, intellectual capabilities, food habits etc are declared equal en masse! We can find many commentaries, ancient as well as modern, on Bhagavadgeeta wherein scholars have exhibited their intellectual acumen. Once we grasp the real intention of the author, we can naturally conclude that some commentators actually mislead us. A pandit cannot chew grass, the food of cows, to prove that he is equal to a cow! (samadarshin). Moreover, the word ‘sama’ does not mean ‘equal’ in all contexts. To cite an example, it is said that Rama was sama-vibhaktāṅga while referring to his proportionate bodily features. If we interpret the word ‘sama’ in the literal sense of “equal”, his nose should be equal in size to his hand! 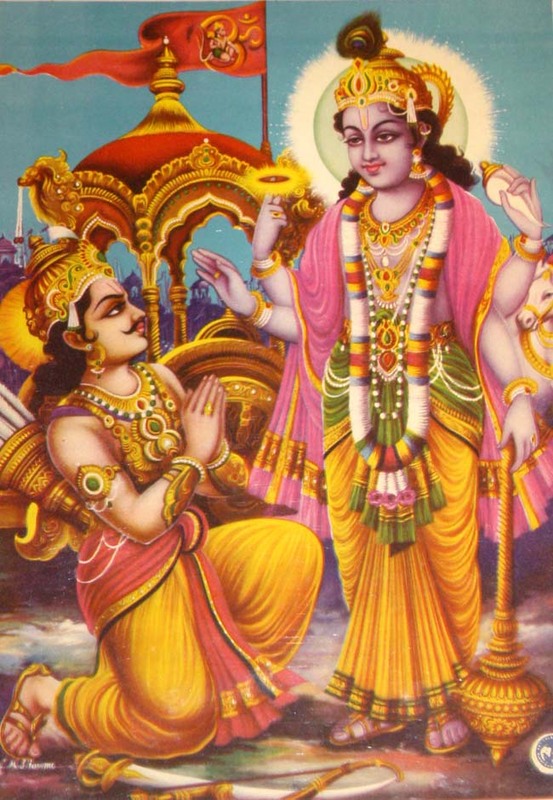 Samavibhaktāṅga simply means that the organs of Rama’s body were ideally proportionate. We should obviously know the context while interpreting a person’s statements. The statement we are trying to analyse is from Bhagavadgeetha which is in the form of verses. One can comprehend the totality of the meaning only if the cited quotation is read with the meanings of preceding and succeeding verses! In the very next stanza, Bhagawan Krishna makes it clear that the Brahman (the Supreme) is one bereft of defects and is also ‘samam’(Nirdosham hi samam Brahma). Obviously, a true pandit sees this ‘samam’ in all living beings. While elucidating this beautiful simple explanation, Srirangamahaguru has further made it more comprehensible once with the help of a simple experiment. He drew the pictures of all beings quoted in the verse: a brahmin, a cow, an elephant, a dog and a dog-eater. Later, casually he enquired the disciples around to find out a common factor (if any) in all those pictures. The disciples could find none. Then the Guru drew attention to a small dot he had drawn in all the drawings, and proceeded to explain that just as the dot is common in all the pictures drawn there, a pandit visualizes Brahman as a common factor in all the beings. The word ‘pandit’ here is not used in a narrow sense meaning a ‘scholar’. The word ‘Panda’implies knowledge of the Self(Brahman) and hence the person who has realised Brahman is a real pandit. As one who sees ‘gold’ as a common factor in the diverse gold-ornaments, a true pandit sees Brahman as the common factor and hence aSamadarshin!